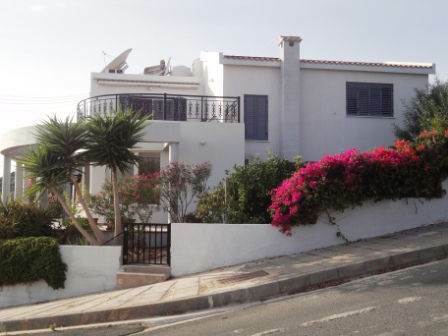 Peyia, Paphos - This impressive 3 storey property is located on a large corner plot of a quiet residential cul-de-sac. The popular village of Peyia, which has a large variety of local amenities, is a few minute’s drive away. Being a corner plot, there is access to the property on two sides. At the front there are steps leading up to the entrance door, and from the side there is a gated entrance with no steps. Walking in, there is a spacious living room with corner bar to the right, and dining room & kitchen to the left. The kitchen is fully fitted and very well equipped . Patio doors lead from the dining room to the terrace and pool. Also on the ground floor is a huge master bedroom with a wall of fitted wardrobes including integral lighting. The en-suite has a bath and separate shower, storage & fitted vanity unit. A 2nd large bedroom is being used as a study, and there is a guest toilet. Moving to the first floor, there are 3 further double bedrooms, all with fitted wardrobes, and a large family bathroom with washing machine. There is no shortage of storage space in this home, with a complete room of wall to wall cupboards. From the central landing and one bedroom, there is access to a large balcony with fantastic sea and mountain views. The 3rd level of this amazing property is the basement which includes a fully fitted utility room, wine cellar/cool larder, garage and workshop area. A marble staircase leads up to the ground floor accommodation. Outside, there is plenty of space from the front terrace that circles the property, the side terrace with built-in grill beside the swimming pool, and the mature landscaped gardens. A fruit orchard has a large variety of fruit trees including, lime, fig, apple, lemon and more. As the property is elevated above the property above, you can still enjoy the sea views from the pool. Without a doubt, this property has been a true home for the current owners in that every comfort has been accommodated for. Please refer to MLS#: 241 when inquiring.